The Dollar Tree inspired yet another activity. I love browsing the aisles on the hunt for inspiration and was super excited when I spotted these green and red apples with the floral stuff on a recent trip.I knew they would make a fun, low prep sorting activity. I love activities, like this apple sorting activity that require little prep and allow kids to work independently,while learning important concepts. As an added bonus, all the items used for this sorting activity were purchased inexpensively at our local Dollar Tree and reused for further learning and activities. Start off by putting all the apples in the bigger basket. 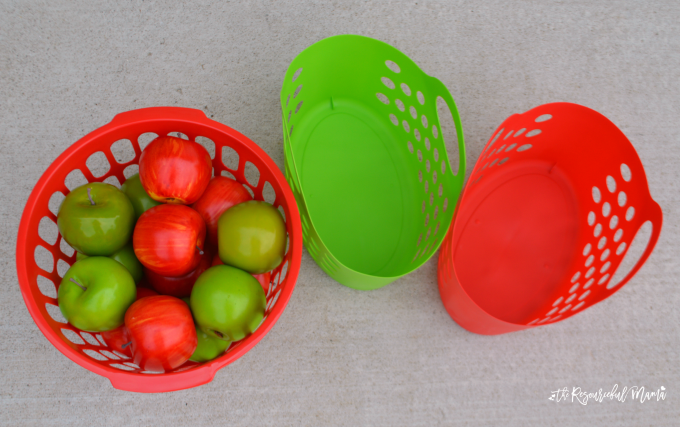 Instruct your child to sort the apples according to color. Sorting is a beginning math skill for toddlers and preschoolers. They are analyzing data, finding relationships among objects, and organizing to into groups while gaining a sense of accomplishment. Our 3 1/2 year old daughter enjoyed sorting the apples, but it was really easy for her. It is best suited for a toddlers. Our kindergartener and preschooler are enjoying the apples and baskets in their pretend play. They have played visit the apple orchard and shop for apples at that the grocery. Use the apples to practice counting or making patterns. Read books about apples such as Ten Apples Up On Top! or Curious George Apple Harvest. This is a great activity for young kids – it combines fine motor and sensory with sorting colors. What a great activity for Fall! It would be a fun way to keep my little one busy while I make dinner! Thank you Karen! My kids are having a good time playing with the apples and baskets. Thank you My Bored Toddler! It so easy to put together and provided lots of fun and learning.